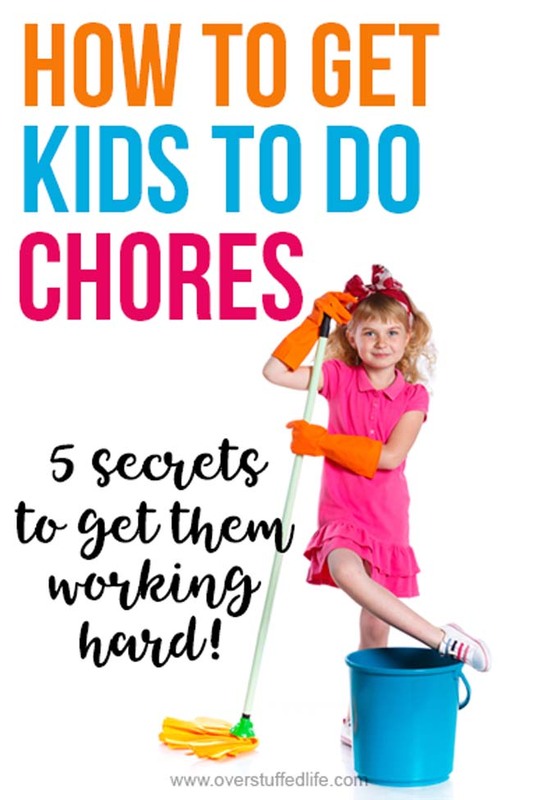 Chores for kids are necessary to teach them how to work hard and do their part. 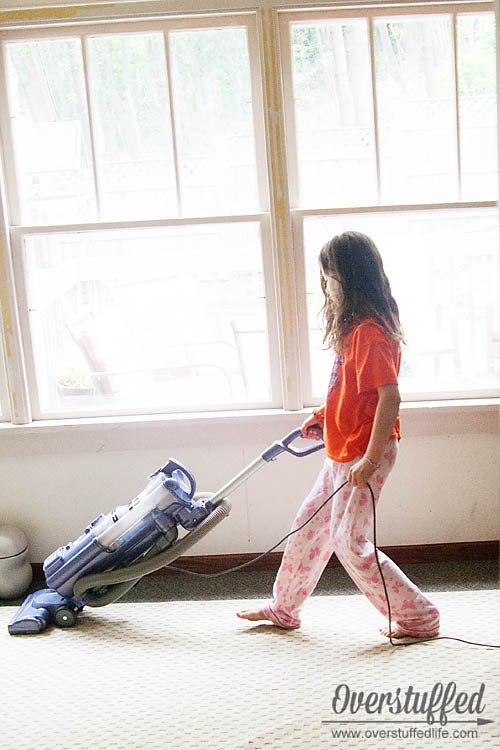 Try these simple tips to get your kids doing their chores happily. If your kids are anything like mine, the prospect of a Saturday morning filled with doing chores does not cause them to jump for joy. And if you are anything like me, the prospect of trying to convince your children to spend their Saturday morning doing chores does not cause you to jump for joy, either. But, whether or not you're happy about it, housework must go on. As a mother, I consider it a huge responsibility to teach my children how to do it so that when they go out into the world they aren't driving their college roommates or spouses insane. And, you know, so that they are living in a clean and healthy environment. Whenever I tell the girls it's their turn to do the dishes, there's a collective groan. But then I put on their favorite music and the cleaning suddenly becomes fun. They dance and sing to One Direction and R5 and whatever other music it is they love, the dishes get clean, and everyone is happy (mind you—if we were cleaning to MY favorite music, it would be very different)(I think it's pretty fun to clean to a rousing Rossini opera aria, don't you?). Besides music, there's plenty of other ways to make chores fun. You know your kids best, and you know what that means for each individual kid. My Sophia will clean anything if it is made into a competition. I will often challenge her to a race to see if she can clean her room faster than I can clean mine. Or I will say "I bet you can't clean your zone in less than 10 minutes!" and she will jump up and hurry to prove me wrong. One day, all on her own, she decided to become the "Cleaning Ninja." She put on a mask, filled her apron pockets with cleaning supplies and practically cleaned the whole house. She had a blast doing it, so sometimes I ask her if the Cleaning Ninja is willing to do a few chores for me and she's off like lightning! One of my favorite memories with my children happened last fall. We were all in the kitchen together, working on making dinner and doing some clean up. We were blasting The Beatles while Chloe was chopping vegetables, Sophia was shelling beans, Bria was doing some dishes, and Joel and I were working at various other meal prep. I was actually using the blender to make some cauliflower soup, and I over filled it. As you might imagine, I had a cauliflower explosion all over the kitchen--there was soup everywhere! On the fridge, the floor, the cupboards, the walls, and even the ceiling. We were all so happy working together, though, that the mess didn't faze anyone. We laughed about it, cleaned it up together, and finished dinner. When we are doing all the work together, it feels easier for the kids. 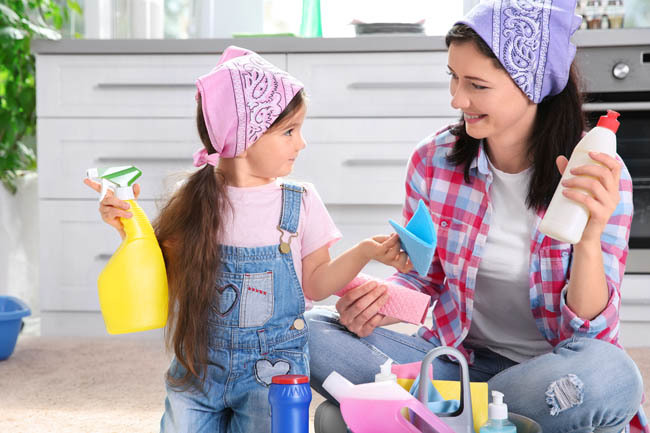 For younger kids, it's a necessity to be right alongside them while they are first learning how to do certain chores. 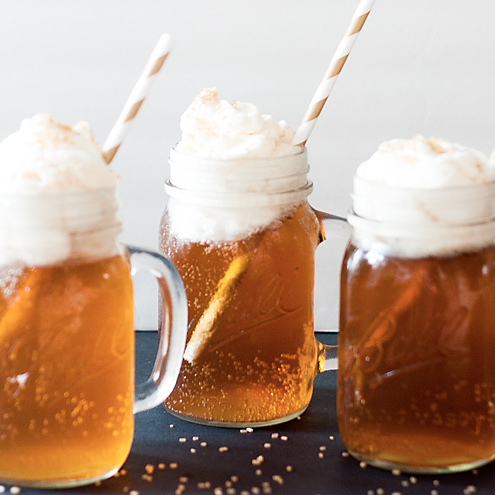 It doesn't mean you're doing it for them, but it does help them to feel more confident, stay on task, and actually enjoy it when you are with them--provided you're also trying to make it fun. Dividing one big cleaning project up and doing it all together as a family can be a lot of fun. There is less likelihood of complaining when you work together, too. I usually employ this tactic for kitchen clean-up or big rooms like the family room or living room. Leaving your child alone to clean is fine (see #3), but if you can work right next to them, things get done faster and better and everyone is happier. Telling a child to "clean the living room" will never mean the same thing to the child as it does to you. They will either try their best and forget several things, or they will get so overwhelmed with the idea that they won't know where to begin. Don't make your kids eat the entire elephant with eating! Give it to them in bite-sized pieces, and they will feel much more successful. I have created detailed lists for each room in my home (you can find printable versions here: Is Your Room Mommy Clean? and here: Printable Cleaning Checklists). 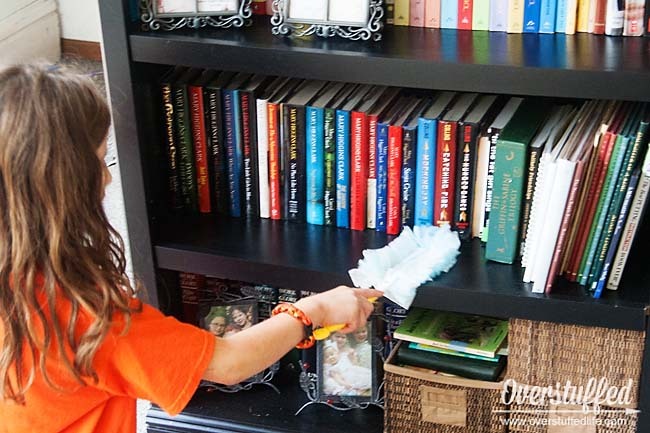 This way, the kids can do the smaller tasks that make up the larger task of cleaning a room. It's much easier to "pick up the floor," "dust the bookshelves," and "vacuum the rug" than it is to "clean the living room." The very first time I introduced these cleaning lists to my children, they were thrilled. Chloe happily and thoroughly cleaned the bathroom and was excited to check off each item. It seriously changed my life as a mother to make these lists. Try it! You'll be pleasantly surprised. 4. Be a good example. If you are constantly complaining about cleaning, your children will, too! I learned this the hard way, and I am still learning. Let your children see you cleaning on a regular basis. If you require them to clean their room every day, don't be leaving your bed unmade and clothes all over the floor. They watch you and they will do what you do. Finally, teach them what a great reward a clean house is, in and of itself. We all feel better when our environment is free of clutter and dirt. Home is just a happier place to be when it is clean. The younger your children learn this lesson, the better. 5. Give them cleaning tools that are easy to use. 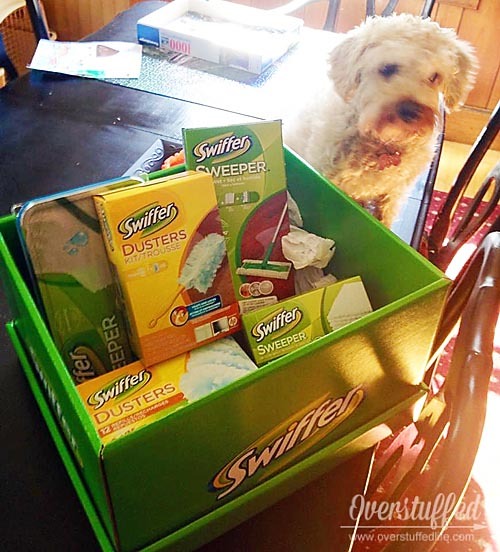 Swiffer recently sent me a big green box full of awesome Swiffer cleaning supplies. One might assume that my kids wouldn't think it was very cool, but they did. And they couldn't wait to use them. The box included Swiffer brand dusters, duster refills, and a Swiffer sweeper with both wet and dry refills. I have loved my Swiffer products for a long time because they are so easy and quick to use. In fact, when the Swiffer sweeper very first came out I was a newlywed. Every time I saw the commercial for it (click here to see a more current Swiffer commercial starring Eric Stonestreet), I would mention how cool it looked and how much I would like one because I hated dragging out my mop and bucket to mop our kitchen floor that was all of ten square feet. Well, guess what was under the tree from The Maestro for our very first Christmas as husband and wife? Yup. My first Swiffer sweeper. And I was in no way offended, because I really wanted it! Anyway, my girls were very excited to use the products in the big green box from Swiffer. Sophia fell in love with the dusters in particular and had a grand old time dusting the entire house with them. The reason that she loves them so much is because she doesn't have trouble using them. Dusting with furniture spray and a cloth is more tedious and time consuming. And mopping with a traditional mop and bucket is, too. Which is why the girls like to use the Swiffer sweepers, instead. Swiffer makes cleaning easier, no matter who is doing the cleaning. All of the photos in this post show my children cleaning without complaint on a Saturday morning (which, incidentally, is why they also look like ragamuffins). Believe me when I say that the music is blaring and that I am working right alongside them. They had their lists and they had their Swiffer tools, and they finished up quickly and happily. Be still my heart—what more could a mom ask for? 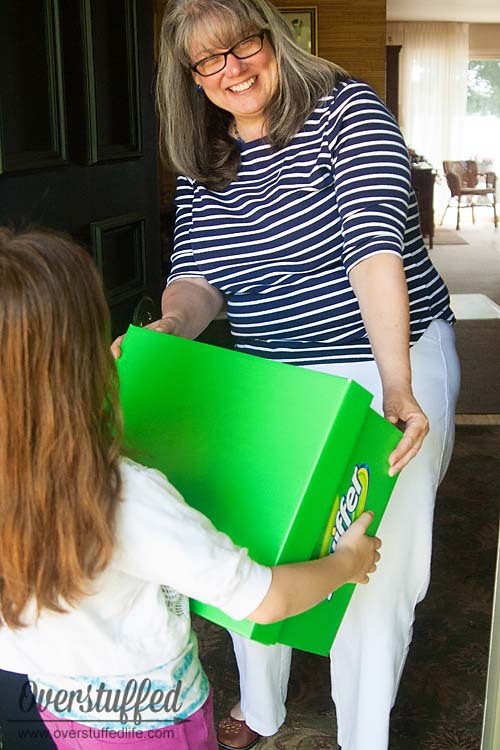 How about a SECOND big green Swiffer box? Swiffer actually sent me a second box with the stipulation that I surprise a friend with it. So Sophia and I headed over to my friend Lisa's house and caught her just before she left to go grocery shopping. 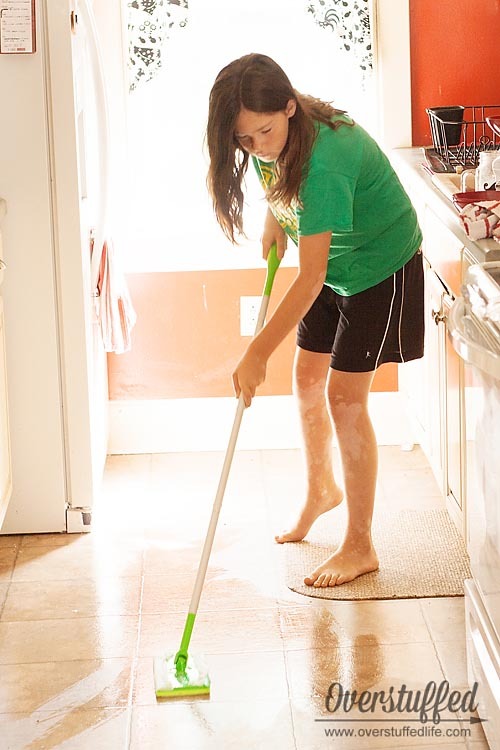 How do you get your kids to help clean the house? Great tips! I need to remember these for our before school cleaning routines. Wonderful tips! Breaking it down in to smaller steps used to be so hard for me, but with a child with autism in the house, it is essential! If I say clean your room, he is completely lost. But if I break each task down and give one at a time, he does great. This is one of the better affiliate posts I've seen. Definitely useful tips and high quality photos. Nice work! Talk to you again soon! I actually really like Swiffer, in as much as I am capable of liking anything to do with housework. As far as I can tell, they don't really seem to be chock-full-o chemicals, so that to me is reason enough to love them! 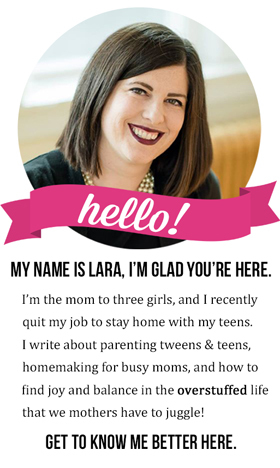 Great tips Lara! And I love Swiffer products too... they make cleaning as fun as it can be :) I'm pinning this to remind myself of these tips... so I can get my kids cleaning more too! I love using Swiffer too! While my teenagers are not always easy to get to do their chores, my son has surprised me but taking out the garbage more than once this week without being told. Maybe there is hope yet! Love Swiffer! When we first got married, we were in a tiny one bedroom apartment and it was so easy to clean using the Swiffer Sweeper. I think their duster is my favorite though. Great tips for kids too! Ours are just two and 6 months so not really any chores to do yet but I'll keep your post in mind once we get there! Swiffer definitely makes it easy for kids to help! Great tips. What great tips, Kim! Thanks so much!! That is an excellent idea! I have two of the sweepers, so I think I will shorten one of them to make it easier for my youngest! I love your happy, enthusiasm about cleaning. Thanks for the tips for getting the kids to join in! My kids at 3, 6, and 8 are not very good at keeping the toys, blankets, pillows, and discarded socks mess to their own rooms and have been going through a case of the dropsies. This makes cleaning the front room and the dining room floors a constant chore (and not one like washing dishes that they are young enough to actually enjoy.) The times that they clean up the fastest is when it is a game. This week, I had a dutch auction night with them where each person was their own team. I would challenge them to bring me something round, or all one color, something with a face or wordson it. The rule was that they had to put each item away after I gave them credit. I made up the challenges as I went along, but I am thinking of making up a list of items to keep on hand. As they get older, I am sure that they will want to be able to "win" versus us making sure each kid got each item without a time limit, but for now, easy no-arguments picking up and mine still like to dust. 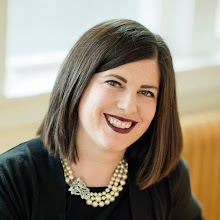 :-) I hope this helps someone elsewith littles.